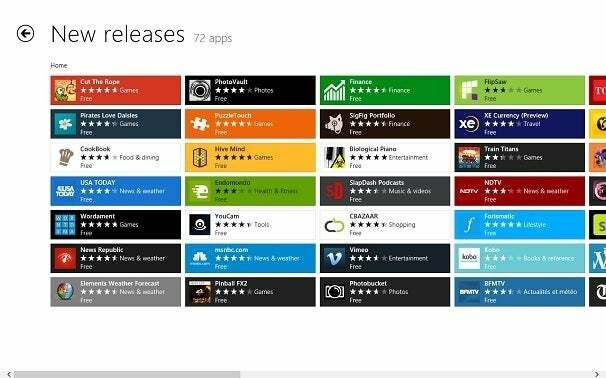 With the launch of the Windows 8 Consumer Preview, Microsoft has embraced the age of the app and opened its own app store -- the Windows Store. 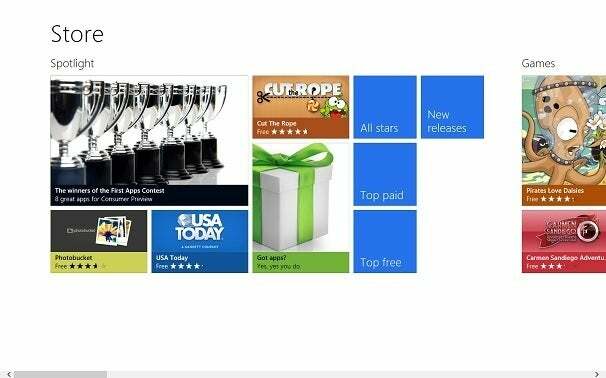 The Windows Store uses the same "Metro" aesthetic as the Windows 8 Start screen, with blocks of rectangular app icons sprawled across a long, horizontally-scrolling list. Each category gets its own clump -- for lack of a better term -- on the Store's home page, with featured apps, curated lists, and links for top paid and top free apps. The way these categories are spread out across the main screen makes casual browsing enjoyable, although getting to a particular category can be slightly frustrating without a master list. Clicking an individual app brings up a description page, with an overview as well as screenshots, user reviews, and other details, such as what types of data the app intends to access. These pages are pretty thorough, but eventually I'd like to see links for more apps from the developer, plus other similar apps that users also installed. All apps in the Windows 8 Consumer Preview are free, and installing them is as simple as clicking the "Install" button on the app description page. For paid apps, developers will be able to include a "Try" button for timed or feature-locked app trials, alongside a "Buy" button. For the final version of Windows 8, paid apps will cost a minimum of $1.49, and a maximum of $999. 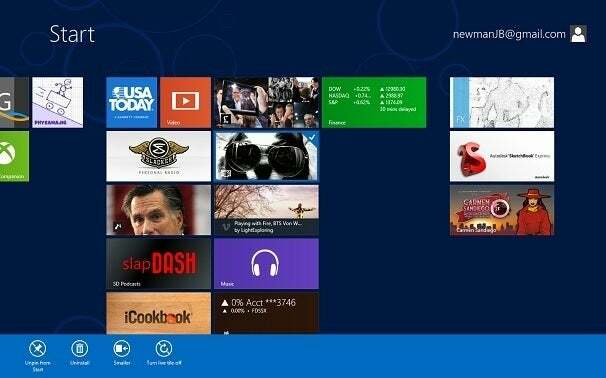 Installed apps appear on the Windows 8 Start screen, but they don't have to stay there. Users can unpin the app so it only appears in the "All Apps" list (accessed by right-clicking on the Start screen). Uninstalling is easy: Just right-click the app (or swipe down on a touch screen), then select "Uninstall" from the menu on the bottom of the screen. In welcome contrast to Apple's iOS App Store, users have the option to uninstall apps that are included with Windows 8, such as Mail, SkyDrive, and Xbox LIVE. These apps have their own section in the Windows Store if the user wants to reinstall them. The final version of the Windows Store will include some features that aren't yet part of the Consumer Preview. For instance, if the user visits a Website that has an app in the Windows Store, an icon will appear in Internet Explorer 10 linking to the app page -- or to the app itself, if the user already has it. Microsoft also plans to make Windows Store app pages discoverable through Bing, but that hasn't happened yet. 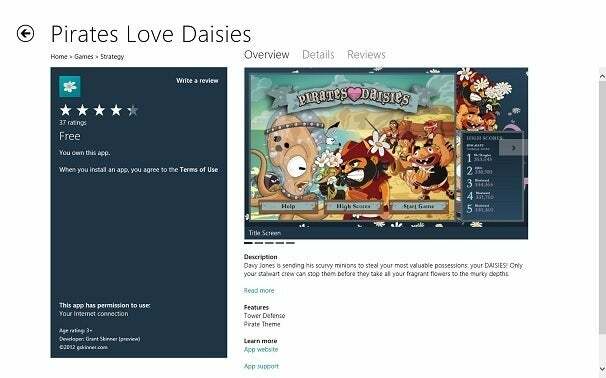 Eventually, the Windows Store will also feature listings for desktop apps sold outside of Microsoft's ecosystem, which will take users to external Websites for purchasing. Not many apps may go this route in the end, but at the moment, no such listings are part of the Windows 8 Consumer Preview. In any case, Metro-style apps will only be available through the Windows Store. External listings will only be available for desktop apps. Currently 72 apps are available in the Windows Store.